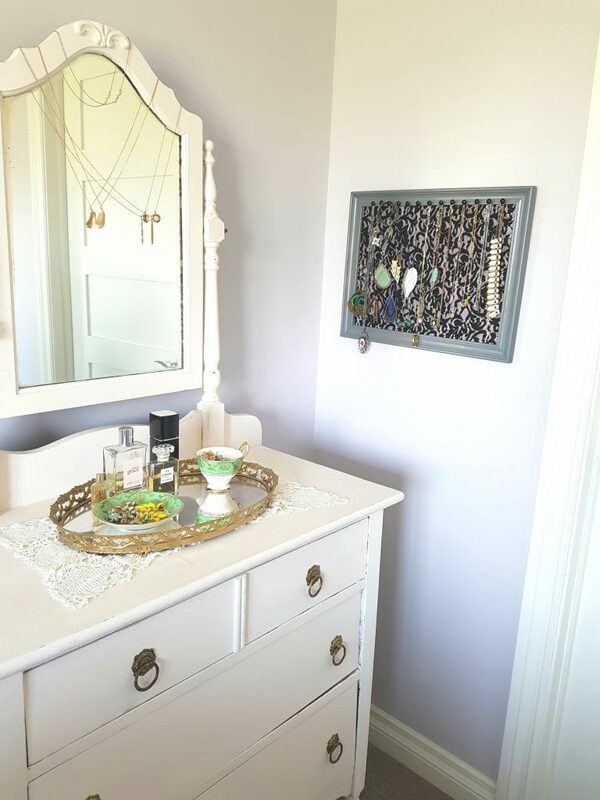 You can create an easy 10 minute DIY Jewelry Display for your bedroom wall to add functionality and style to your space. In an effort to de-clutter and create a more beautiful space in my bedroom, I wanted to come up with a functional and lovely DIY craft design for displaying my jewelry, namely earrings and necklaces. The clutter and the mess of having necklaces tangled together and earrings getting misplaced was starting to frustrate me. I wanted a wall hanging doubling as a jewelry display that was out of the dresser clutter and would add some home decor drama to a blank wall. 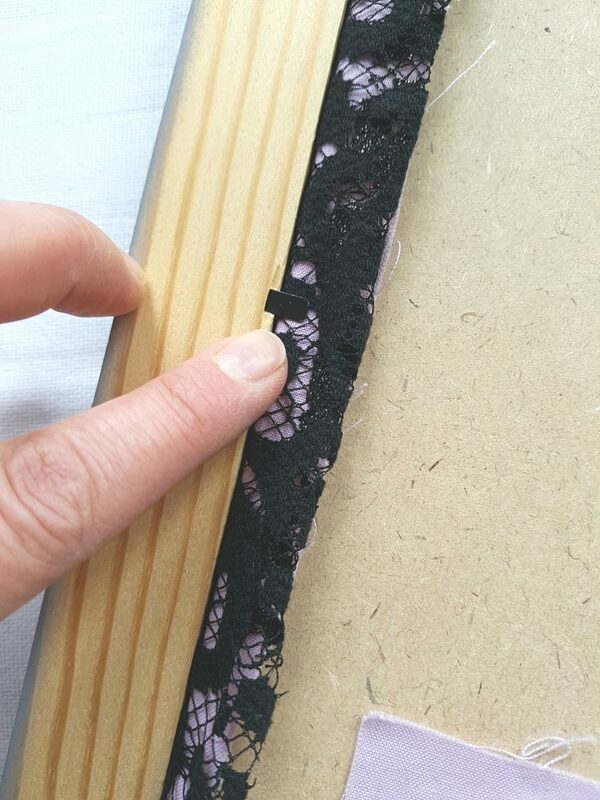 I chose black lace material and a coordinating material underneath to go with the mauve in the room. 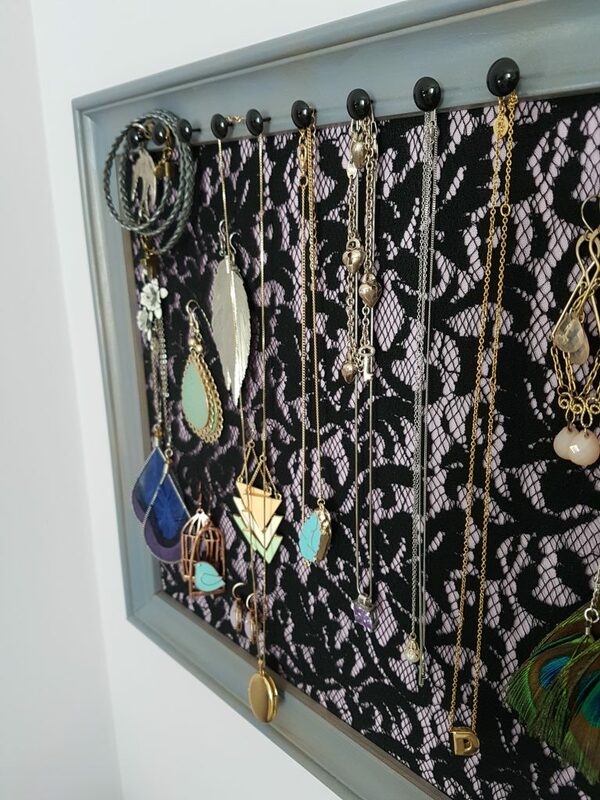 The two fit together very nicely to create this 10 minute DIY Jewelry Display. 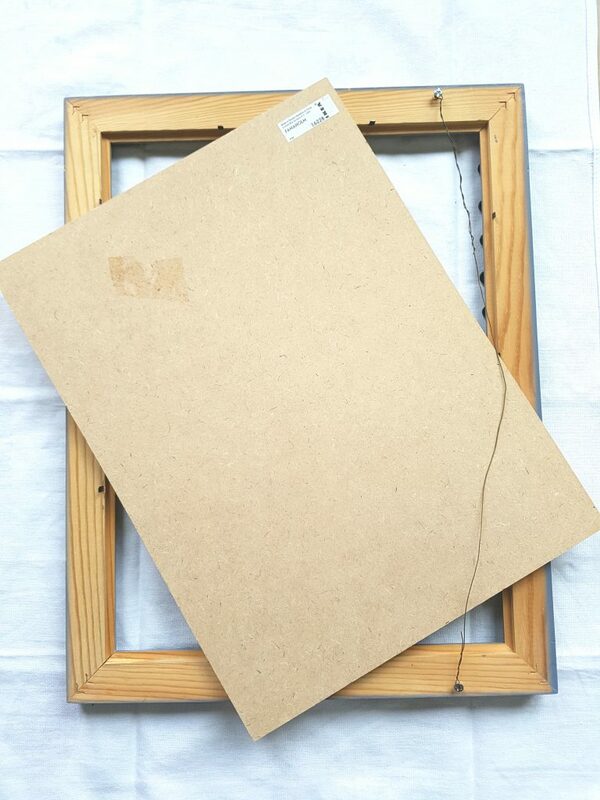 First take out the backing and the glass out of the frame. 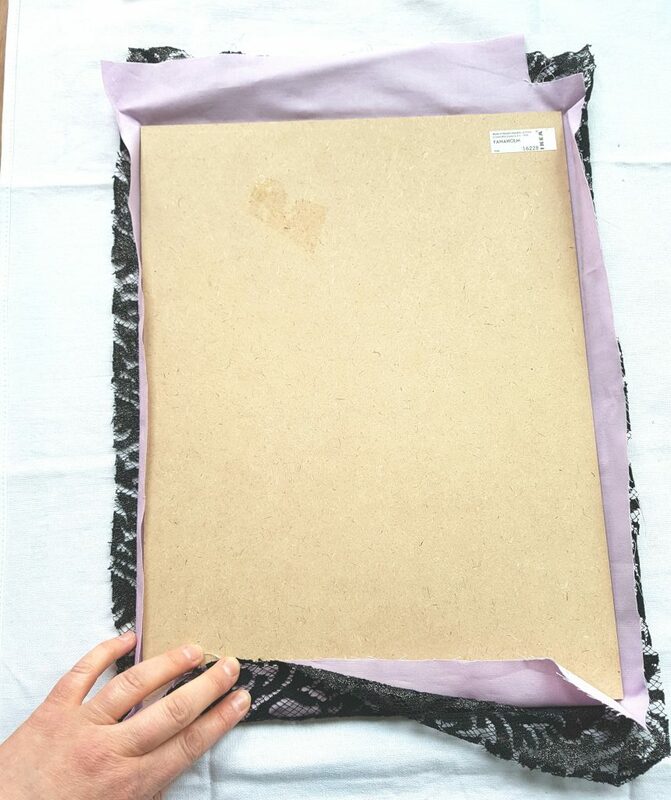 You will need to adhere the fabric to the backing in the next step. Grab some craft paint, apply and let dry for prior to the following steps other steps. Next, I cut the lace and fabric to fit and overlap the frame backing. The frame I used had the handy bendable back fasteners. After I bent the fasteners down, I pulled the material tighter at the back. 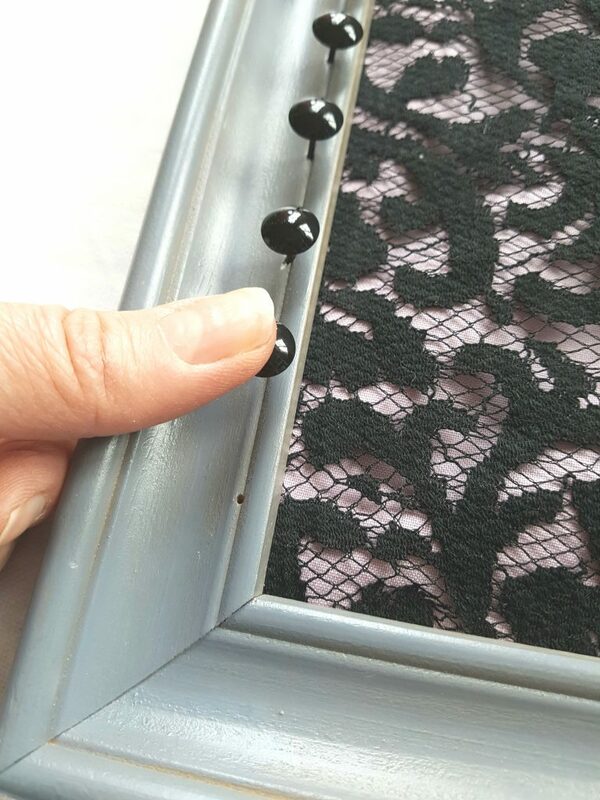 If I was hanging heavier items from the lace, I would have used hot glue to adhere the material to the frame backing. I took upholstery tacks and pushed them into the front top of the frame. These can be bought at a hardware or even fabric store, as regular tacks aren’t long enough. It is important to have a wood frame in order for the tacks to go in. Take two screw eyes and twist them into the sides of the frame and then attach the wire to the eye screws. The frame already had a wire attached to two screws at the back and so my 10 minute DIY jewelry display project was ready for hanging. I was excited to hang my new DIY craft on the wall and add all of my lovelies. If you like FREE, head on over to the FREE PRINTABLES gallery page and grab your goodies! There are two 2018 Calendars, hand lettered prints, watercolour art, gift tags, cards and much more! If you like what you read, please share the love with a comment, share or pin. Thank you! Enjoy the beauty around you today!